Prime Minister Benjamin Netanyahu: Secretary Panetta, Leon, it’s good to welcome you again to Jerusalem, First I want to use this opportunity to thank you, President Obama and the American Congress for enhancing the strategic relationship between our two countries. At this time of great instability in our region, the strong bi-partisan message of support for Israel is deeply appreciated. Today we’ll have the opportunity to discuss the many challenges facing our region and no challenge is greater than stopping Iran’s pursuit of a nuclear weapons capability. Iran is the foremost sponsor of terrorism, and everything must be done to keep Iran, the world’s most dangerous regime, from developing the world’s most dangerous weapons. You recently said that sanctions on Iran are having a big impact on the Iranian economy and that is correct. And I’m sure that the recent sanctions advanced by the President and the Congress will have an even greater impact on Iran’s economy. But unfortunately, it’s also true that neither sanctions nor diplomacy have yet had any impact on Iran’s nuclear weapons program. America and Israel have also made clear that all options are on the table. You yourself said a few months ago that when all else fails, America will act. But these declarations have also not yet convinced the Iranians to stop their program. However forceful our statements, they have not convinced Iran that we are serious about stopping them. Right now the Iranian regime believes that the international community does not have the will to stop its nuclear program. This must change and it must change quickly, because time to resolve this issue peacefully is running out. So I look forward to speaking to you about this challenge and about the many other challenges facing our region during this turbulent time. God knows that there are so many of them and each day just adds new ones, but I can think of no one better to discuss all this than you, Leon, so I welcome you again to Jerusalem. 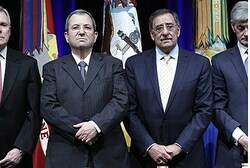 Secretary of Defense Leon Panetta: Thank you very much Mr. Prime Minister. Thank you for hosting me in Jerusalem again. It is a pleasure and I mean that sincerely, it is a pleasure to meet again for the third time and to have this opportunity to discuss the many issues that confront both Israel and the United States. I’ve had the opportunity to do that a number of times in other capacities and now as Secretary of Defense. Let me begin as I stated earlier today, my condolences on the attack on Israeli citizens and I want you to know that the American people deeply share your outrage on this. Earlier today I had the opportunity, just coming from there to visit at the Iron Dome facility with Minister Barak, and I am very proud of the support that the United States has been able to provide Israel to acquire this life saving capability. You yourself said that this is not about something to start wars with, this is designed to prevent wars and I agree with that. I’m also proud of the defense cooperation that we’ve been able to achieve over the past few years which is really closer than at any point in our history. My visit takes place during a time, as you pointed out, of great change and turmoil in the region. I just came from visits to Tunisia, the birthplace of the Arab Spring. I visited Egypt, here in Israel, and then from here I will go to Jordan. We share, Israel and the United States, shares deep concerns about the violence that’s taking place in neighboring Syria and Iran’s nuclear ambitions. And I want to reassert again the position of the United States that with regards to Iran, we will not allow Iran to develop a nuclear weapon, period. We will not allow them to develop a nuclear weapon, and we will exert all options in the effort to ensure that that does not happen. I want you and the people of Israel to know a few things that have not and will not change. The United States stands firmly with Israel, and we have a rock solid commitment to the security of Israel and to the security of its citizens. And make no mistake, we will remain determined to prevent Iran from ever acquiring a nuclear weapon. I want to thank you for your friendship, for helping to advance the US-Israeli defense relationship, which is essential to the security of our nations in the 21st century. I look forward to continue to work with you, with Minister Barak, to ensure Israel’s qualitative military edge. And to support continuing efforts to work towards a sustainable comprehensive peace and a two-state solution. Israeli Defense Minister Ehud Barak will meet with his U.S. counterpart, Leon Panetta, in Washington amid reports that Iran may have achieved the capability to build a nuclear bomb. Israel has said that such a capability is a “red line” that could trigger military action. The defense chiefs are scheduled to meet Thursday. The Associated Press reported this week that it had obtained a drawing of an explosives containment chamber said to exist on an Iranian military site. The chamber’s only known use would be to test nuclear weapons. Iran has denied reports that it is seeking a nuclear weapon. Western experts have said the Islamic Republic appears to be moving closer to such a capability. The Obama administration has endeavored to keep Israel from striking while it pursues sanctions and diplomatic pressure as a means of getting Iran to retreat from its suspected nuclear weapons program.